Is your sales engineering team under appreciated and under-funded? Are you worried it will be the first budget to get cut? Organizations often know they need technical sales support but struggle to win the budget and resources needed to build a stellar sales engineering team. It comes down to two main areas: demonstrating value and impact on closed deals, and getting the right team in place to drive your company’s sales and demo process. On October 17, we’re teaming up with Gregory Hanson, author of Modern Software Sales Engineering and the senior director of global presales at SmartBear, to present a webinar on how to recognize and prove the value of sales engineering teams. Gregory has been with SmartBear for the past six years building and managing its sales engineering organization to span five teams across four continents. Gregory will be joined by our very own Lee Berkman, virtual IT labs expert at CloudShare, who will share how to enable your sales engineering teams with the right tools for success. This webinar is a don’t miss. Watch it here. 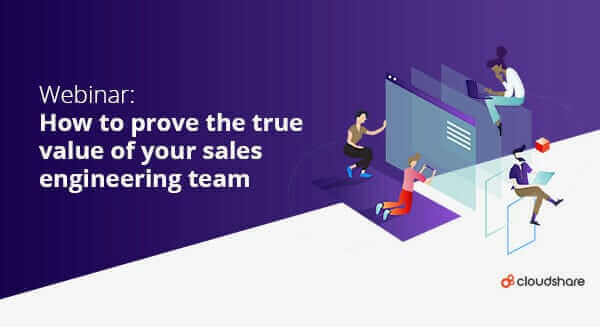 During the webinar, you’ll learn how to best combat executives’ typical reaction to recognizing the need for a technical addition to sales, how to build, train and grow your sales engineering team, how to prove its value, and how to integrate it with your existing sales team to enable everyone’s success. We also will share our experience helping large enterprises solve real business problems with cloud-based sales training solutions. We’ll share key takeaways on tools built for the modern sales process, including why virtual IT labs are the answer (and why in-person demos aren’t), and how sales engineers can track activity metrics to move faster, eliminate hardware, streamline processes and improve executive visibility. When the point of contact was accessed, by whom and the length of time it took to complete. Gregory and Lee will detail all you need to prove the value of your team to your C-Suite so you can build a successful team. And, you’ll also get to experience a virtual IT labs demo to experience its benefits firsthand.